This version of Kou Rou is surely for refreshment for the palate! I would like to consider this an entirely different pork belly dish. Not only the side ingredients were adapted for auspicious purpose, the recipe was just different. Cai po, Miso paste, mirin, etc were used here.. Weird? It turned out so well, in fact! White radish logically absorbed full flavor of the sauce, while pineapple yields mild sweetness that refreshes our palate, especially after having much pork fat. Of course, soft taro complements the dish to its perfection. 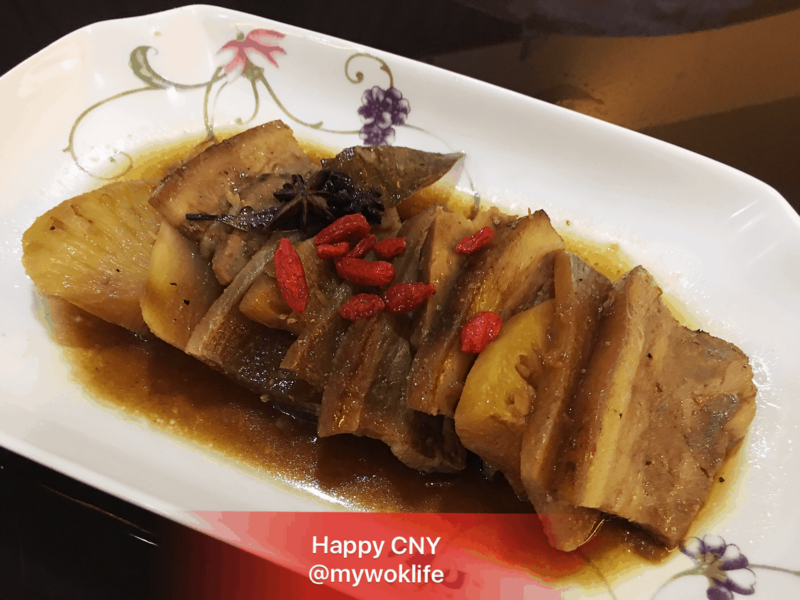 Sure you would want to spice up your reunion dinner and Chinese New Year gatherings with this delicious & auspicious dish! (1) Blanch pork belly in hot water. Pat dry and rub on dark and light soy sauces. Leave it to season for 20 minutes. (2) Peel and slice taro and white radish. Sprinkle salt and cooking oil on the slices. Air fry at 180deg Celsius for 8 minutes (or deep fry till lightly browned). Set aside. (3) Air fry pork belly at 180deg Celsius for 8-10 minutes each side (or pat dry and deep fry till golden browned). Leave it to cool and slice thickly. Note that do not discard the marination sauce away. (4) Now return marination sauce and add red fermented beancurd, Miso sauce, mirin, ground ginger, five spice powder, brown sugar, Cai Po. Mix well. 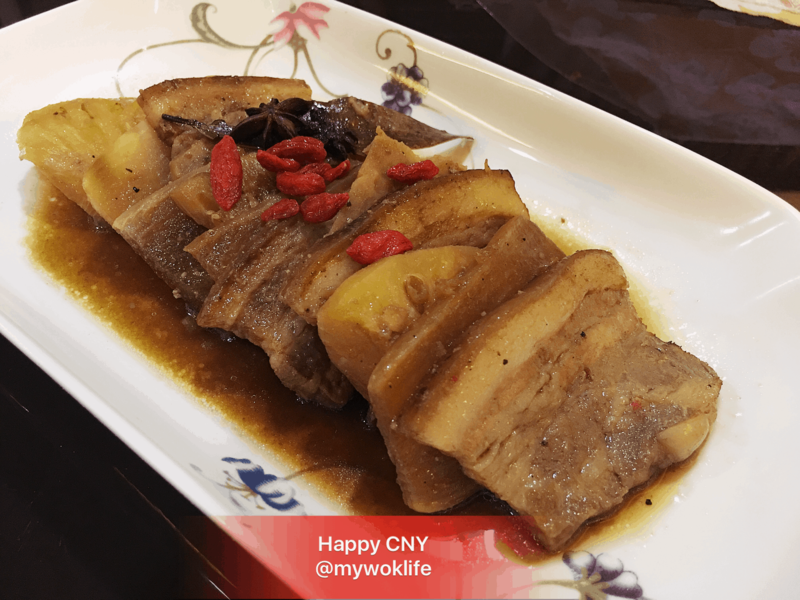 (5) Place pork belly, pineapple, taro and white radish slices in alternate arrangement, in a deep serving dish. Pour sauce mixture over, and add bay leave and star anises. (6) Steam pork belly dish for 45 minutes to an hour. Garnish and serve with steamed white rice, or plain buns. Tips: Use deep serving dish to plate the dish as it will turn lot more saucy after steaming.